Apricots are not as popular as apples and bananas, but they are just as healthy, if not more so. And, there are several different varieties. 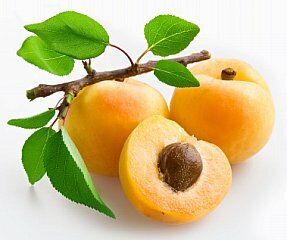 Apricots are an excellent source of Vitamins A, C, E, potassium, and iron, as well as being a great source of beta-carotene. The fruit contains no fat and a small amount of carbs (about 8g of carbs for two apricots, 2 of those being from dietary fiber). They are very beneficial for good eyesight and also help to prevent heart disease and other ailments. Rich in powerful antioxidants, such as Lycopene, apricots strengthen the immune system. They are also a good source of fiber. Dried apricots have an even higher concentration of vitamins and nutrients, but are also slightly higher in carbs. Apricots can be enjoyed in cakes and pies, with ice cream or sorbets and yogurt, as a jam or jelly, used as a sauce or as a fruit topping for salads, cereal, pancakes, and other foods. You could go looking for apricot products here.